This post is my honest Peru hop review based on my experience travelling with this bus company from Lima to Machu Pichu for a month. Stops included Paracas, Arequipa, Puno and Cusco. I hope this post will help you decide whether Peru hop is something for you. “Please hopsters, do not use the toilet for big needs. Only small needs, so if you feel something bigger needs to come out. Please come to me and we will try to find a solution” said our Peru Hop guide while explaining the bus rules for us hopsters. Yes, I was now being addressed as a hopster. I looked around me and the bus was full with young backpackers still sleeping out their hang-overs from last night’s hostel party. They were barely listening to the information that was thrown at us about our schedule. As an independent backpacker with a more introvert personality I have always preferred to go my own way. And yet, here I was in a bus, being told how my next days will look like. It sounded an awful lot like a tourbus to me and I wondered why I signed up for this. I found Peru Hop online after booking a cheap ticket to Lima. It was my first trip to South America and I had only one month to prepare. The hop on hop off service from Lima to Machu Pichu seemed like a perfect solution for my tight schedule. The advantage of Peru Hop is that they make several stops on the way that public transport would pass by. As we drove out of Lima our guide explained how the slums, that we could now see from our windows, developed in the sixties and eighties. Migrants and refugees flocked to the city in search for a better life, most of them escaping the civil war with the Shining Path in the rural areas. They occupied the dry hills looking out over the sea and built their simple homes. We make a quick stop at Cristo del Pacifico, a huge statue of Jesus overlooking the slums. Next to the statue is also a memorial for the soldiers who died in the war between Peru and Chile. This is a desolate spot where Lima ends and the desert begins. It was misty and a strong sea breeze blew through my hair, but the view over the sea and Lima in the distance mesmerized me. There is no other place where it is so visible that Lima is a desert city. It is in fact the second biggest desert city in some of the driest places in the world. Slowly my initial horror about being a hopster is dissipating. I would never have visited this interesting place on my own. The next stop was San José in Chinca. This hacienda was built-in the 18th century for the production of sugar and cotton. African slaves were brought in for cheap labor. The slaves were smuggled in through an underground tunnel system connecting several hacienda’s to the port. San José is now an expensive resort hotel, but one with a dark past in the tunnels underneath. Another stop I would have missed without Peru Hop. In the afternoon we arrived in the seaside town of Paracas. Our guide recommended several restaurants, but somehow most of us ended up in the same place. It had a special discount menu for hopsters and a view on the port of Paracas. The sun was setting and above the sea the sky changed from blue to pink. I talked with the other hopsters about our experiences travelling in South America and other places in the world . They all turned out to be interesting and nice travel companions for the days to come. In the end, being a hopster wasn’t that bad. Peru Hop brought me to the desert Oasis Huacachina, the depths of the beautiful Colca Canyon and the blue waters of Lake Titicaca, the highest lake in the world. Along the way they made several stops, shared interesting information and delivered me safe and well at my hotel. I met a lot of great people who I would not have met otherwise. In the end my Peru hop review is that I was glad I choose Peru Hop. Let me start by saying that I was not offered any discounts or benefits for writing this Peru hop review. Peru Hop was not even aware that I was a travelblogger, because I wanted to write an objective article about this company. So Peru Hop is a bus company with transport from Lima to Paracas, Arequipa, Puno and Cusco. Your bus ticket allows you to make stops on the way for any amount of days you like. 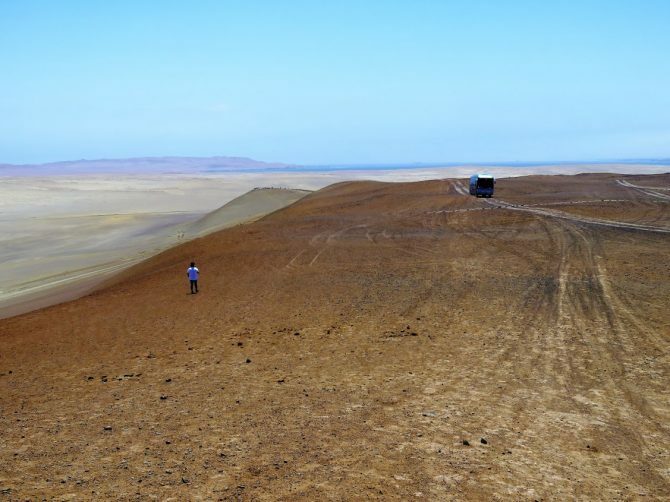 For example you take a bus from Lima to Huacachina where you want to stay one day to go sandboarding and hop on the next day on their bus to Arequipa. There you want to go hiking in the Colca Canyon so you hop off and after 4 days take their bus to Lake Titicaca. I was genuinely impressed by this well organized and flexible company. All staff members are very friendly and answered all possible questions us travellers might have. There is a guide in every bus that can organize your accommodation and a variety of tours in Paracas, Huacachina, Arequipa, Colca Canyon and Lake Titicaca. Peru Hop works together with several hotels so in every place you can choose between different options. In most hotels and some restaurants you get a small discount for being a hopster. You are by the way free to organize your own accomodation and don’t need to stay with Peru Hops suggestions. You are free to organize your own accommodation and tours if you wish so, but I found the prices for the tours very reasonable and in many cases cheaper than if I had to organize things by myself. The Colca Canyon hike and the Lake Titicaca homestay were all professional tours with good guides. It is probably slightly cheaper if you travel by public transport. However, Peru Hop brings you to your hotel. This is not only convenient, but will also save you the costs of a taxi. The discounts you get in hotels and restaurants also add up so in the end prices are more or less the same. What I did miss in Peru Hop compared to public transport is the interaction with the Peruvian people. Public transport for me is part of your journey and gives you a taste of the culture in a country. Peru Hop is not just offering you transport from A to B. It is something in between of a bus tour and independent travel. Your other passengers are mostly young backpackers and most of my interaction was with them. I met a few older independent travellers using Peru Hop, but they were a minority. Once I was in Cusco I was happy to explore the Sacred valley as an independent traveller using the local minibuses and talking with the friendly Peruvian people. Peru Hop is excellent if you have little time to prepare for your trip to Peru or want to see as much as possible in a short time. It is very well-organized and offers good value for your money. As an independent traveller it might sometimes feel a bit too much like a bus tour, but they will bring you to places that are difficult to get to by yourself. The guides offer a lot of interesting background information and are always ready to help you with any problem you might have. Like I said before, in the end being a Hopster wasn’t that bad and I would not have seen so much of Peru without them. Thank you for this candid review – I am also more of a public transport person so would have probably ignored Peru Hop. But it sounds like a good deal. I didn’t even know that a service like Peru Hop existed! By the way, I can totally related on the whole introvert aspect. I think that a bus service like this for me personally would make the trip easier, because as while I like my personal space I do like people around me (even if I don’t know them!). I do love exploring on my own though… something like Peru Hop could be a nice medium. I really want to visit Peru. I agree that when you don’t use public transportation, you lose some interactions with locals, but it sounds like a good trade-off for what you got to see. Pinning this for later! Hey, i found your article at the exact time before planning our getaway to south america:) we’ll be traveling for a few months starting with Brazil, Uruguay, Argentina, Chile,Bolivia and finally Peru..so we’ll have to plan as we go:) very good tip, will keep it in mind! 🙂 Cheers! Thanks for all the great info! This sounds like a good option.